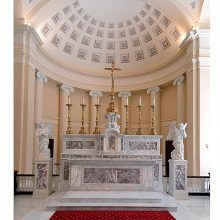 The Baltimore Basilica (Benjamin Henry Latrobe, 1805-1821) is renowned as a forward-looking monument of Neoclassical architecture. 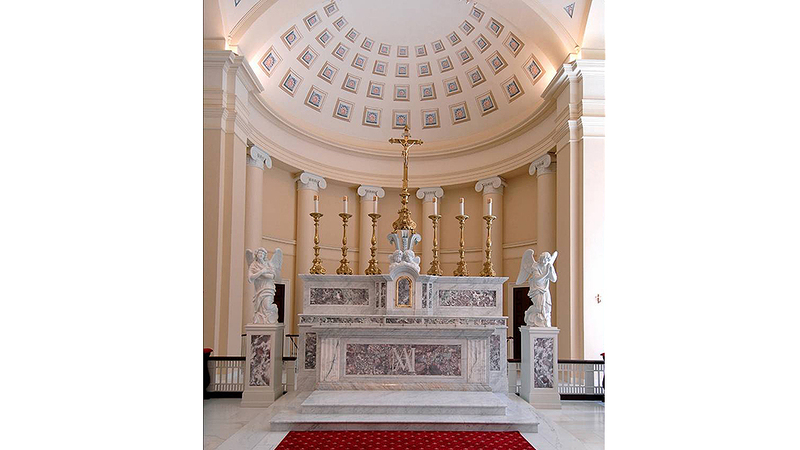 EverGreene was engaged during a comprehensive two-year restoration to provide single-source responsibility for plaster, painting, and decoration in the sanctuary, as well as restoration of the exterior stucco, painting, and gilded crosses. The crowning feature of the plaster restoration is the reconstructed Great Dome using traditional materials of wood lath and lime plaster around 24 skylights in the cupola. Columns, capitals, rosettes, cornices and moldings were recreated to the original design. More than 10,000 square feet of three-coat plaster was applied to restore water-damaged areas or to reconstruct design features. Decorative painting included trompe l’oeil ceiling coffers, stenciling at the altar, grisaille ornament, and the gilding of the baldacchinos. Two new murals were also commissioned from EverGreene, as well as the conservation of historic “Four Evangelists” murals which were discovered buried under plaster.